Scene from Dolores Park Action meeting. Photo by Elizabeth Creely. Roughly 30 concerned neighbors gathered at the event space 18 Reasons Tuesday for an event hosted by San Francisco’s Department of Recreation and Parks. Among the collection of local employees, neighbors and merchants, was an air of seriousness in the room, which suited the matter under discussion: Dolores Park, and its party problem. The park, which is nearing the end of its three-year, 20-million dollar upgrade, has seen an upgrade in park attendance, too: at least ten thousand people visit the park on the weekends, and with the amped-up ebullience has come more of everything else, too, including trash which, according to city estimates, costs San Francisco taxpayers $750,000 to clean up. Much like the abundant spreads frequently found at Dolores, attendees of Tuesday’s event were greeted with salami, prosciutto, grilled chicken, and a salad of what looked like poached eggs bedded on arugula, carefully curated by Bi-Rite and Delfina. “Don’t be shy. Eat the food!” said Shakirah Simley, a community programs manager at Bi-Rite, which had several employees in attendance and is a favorite purveyor for weekend park goers. A less artful spread played out a PowerPoint presentation on a screen in the front of the room. Images of the trashed park alternated with examples of heedless park visitors: there was a screenshot of someone’s Instagram showing a drained coconut shell lying on the battered green grass of the park. “Rum coconut and mimosas in Dolores Park! We love this place!” read the caption. Another Facebook picture showed four friends, smiling in the sunshine. “We are avid trash collectors. We don’t want the man up our bum,” the caption read. On Tuesday, “the man” in question was a woman, Sarah Ballard, the parks department director of policy and public affairs. These days, the park’s popularity is measured by the huge amount of trash left behind by its visitors: 5,000 to 7,000 gallons of trash is scattered among the 14 acre park every weekend by park visitors each weekend day. By comparison, Alamo Square a city park of similar size, has about 2 percent of the trash that accumulates in Dolores Park. The problem goes beyond trash cans said Ballard, “More and more and more trash cans can’t solve this.” Though, the parks department has added more trash cans. Two weeks ago, the parks department and Recology launched an “Eco pop up” station, two large recycling and composting dumpsters to Dolores Park to solve the easiest problem first: where to put the coconut shells, beer bottles, plastic cups and other detritus. The parks department assessed the nature of the trash dumped each weekend and discovered that 65 percent of the litter could be diverted to landfill. People nodded their heads vigorously and took notes. 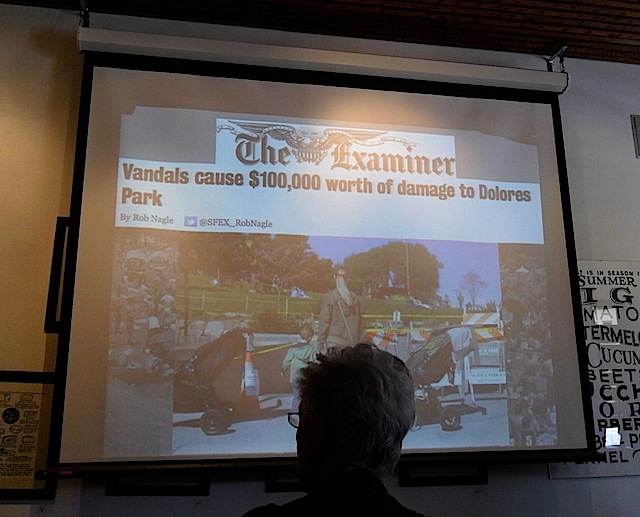 The conversation about cleaning up the park is all intended as a prelude to the gradual re-opening of all of Dolores, slated to start sometime in June in two steps. The north side of the park will open in mid-June with an ADA-compliant entryway, new lawns, paths and lighting, newly revamped tennis and basketball courts, and new park furniture: benches, picnic tables and bathrooms. 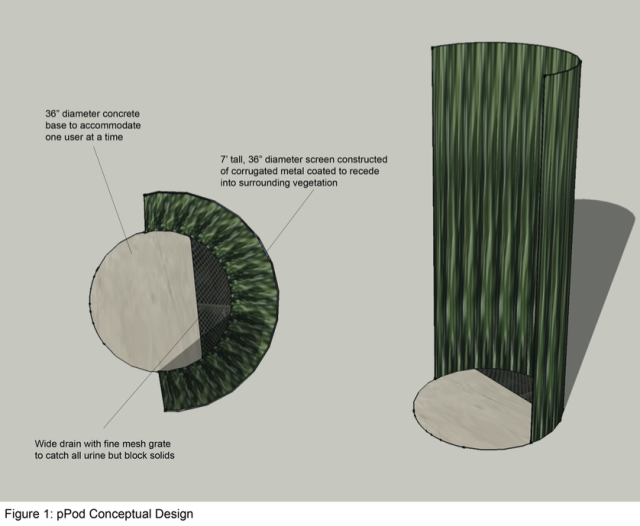 “And in case you haven’t heard, Dolores Park will have the first open-air pissoir in San Francisco,” said Ballard. The future Dolores Park pissoir. Image courtesy SF Recreation and Parks Department. Ballard introduced Ben Lawhon, education director from the Colorado-based organization Leave No Trace: Center for Outdoor Ethics, which San Francisco’s parks department has contracted to consult on the Dolores Park situation. Eighty-five percent of the “litter issues” is about behavior, Lawhon said. Peer-to-peer outreach and self policing by other park visitors is critical to making change happen. “Changing culture is about helping people understand, that, hey. It’s not cool to trash the park,” Lawhon concluded. Flyers were quickly handed out detailing the specifics; a campaign launching in May called “Use the Can.” The campaign will utilize social media, public outreach, and neighborhood ambassadors to what amounts to a lot of constructive peer pressure to push park-goers to pick up after themselves. Those interested in helping “change the culture” can choose from one of three levels: Park Visitor, Friend or Champion, each with it own level of participation. “Visitors” can use social media—”our goal is to create content you can share,” said Ballard— and campaign posters to boost the campaign’s visibility. “Friends” can add the step of using stickers to place on merchandise that are being brought to the park. “Champions” can choose to take the bold step of volunteering in the park on the weekend to “actively meet with, inform and urge park goers” to use the added trash receptacles. The meeting broke up after viewing a whimsical PSA meant to exemplify the tone of the Use the Can Campaign (see below). Neighbors on a whole seemed pleased about this campaign, though some seemed doubtful. Velina Brown, a member of the SF Mime Troupe that performs an annual summer show at Dolores Park, was worried about using the park as a future venue for events. Said like its a bad thing?? Why is it that the homeless are harassed for drinking on the street and the people of Dolores Park are openly consuming alcohol? If you enforced the open container law it would cut down on people who just go there just to drink. Man. I sound like my mother but is the park a place for recreation and exercise or a place to get drunk?